Guests enjoy a no-experience-required art class—all supplies included—directed by trained, local artists, who guide guests step-by-step through a featured painting. A revolutionary way to enjoy art and wine. 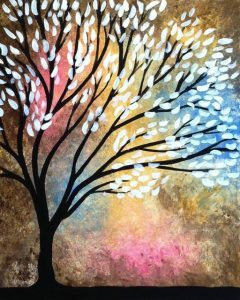 A paint and sip class with an extra dose of heart and soul. When you buy a seat in a Painting It Forward class, you’re making a donation to a nonprofit or community fundraiser. Paint a beautiful painting AND support the Power of the Dream. A portion of the proceeds will go to support our organization. The more painters, the more money raised!